Jennifer and I are happy to host the Fall Cable KAL again this year. This year, the KAL will start September 23 and end March 20th. If you are interested in posting to the blog, please e-mail us at fallcable at gmail dot com and we will add you on! We will also have a Ravelry group, so if you are on Ravelry, please add us to your listing. Before you start posting, please check out the KAL business label for guidelines regarding the blog. Thanks everyone and as always, we look forward to your beautiful work! I have been knitting as much as I can on my cardigan. 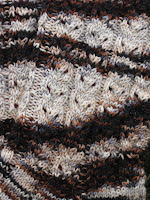 it is very easy to get in the zone and just knit away on this project. I have made some good progress in just a week, especially considering that I have been knitting on another project (Diamond Fantasy Shawl) and I finished a sock. It's not very exciting at this point, but I do like to see the inches of cables and lace increase. I started my Cables and O's cardigan last week. The pattern is in "No Sheep for You" and is being knit by me in cotton - Cotton Glace to be exact, in a very pretty pearl off white. I swatched a lot so I have the stitch pattern memorized already, which makes it a fairly fast knit. Each row, though feels like it takes a while because I am knitting on 266 stitches. My LYS is hosting a KAL for this sweater so I hope that will keep me knitting fast enough to get this sweater finished for wearing this summer. I am so happy to be finished with this sweater. So I can start wearing it, that is! I already love it and can tell I will be wearing it until it falls apart. It fits just right. Gathering Intentions, from Inspired Cable Knits by Fiona Ellis. Mods - I left the i-cord off of the sleeve so I can wash my hands without it dangling in the sink. I've recently completed 2 Capitan Hats . This one in Baby Alpaca Grande by Plymouth for me. This one in Cascade Baby Alpaca Chunky for MIL, as I really didn't like the color, but the yarn was a gift, so for a gift it went. I'm in a cable mood lately, I have 2 other projects OTN. Although it's a little bit late, I finished it before the weather gets warm. And I am proud of myself of knitting this sweater. I don't really like cabling, but after looking at the FO, all the cabling time is worth it. The yarn is very soft, but it does have lots of lints even before I wash it. As for the pattern, I love the top down method since I don't like seaming. It only requires a little seaming underarm. 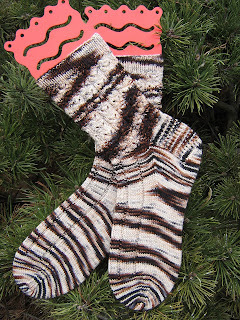 I have finished 2 pair of socks with cables. The first are my Aran Socks. 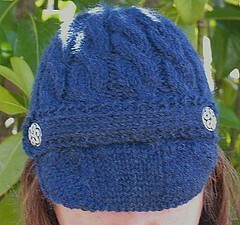 I knit these in Louet Gems Sport wt yarn in Cream. This pattern will be available at The Loopy Ewe probably next week. Still working on the two sweaters, well every now and then anyway. 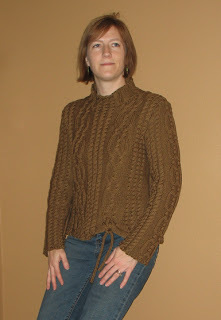 This little vest designed by Marguerite is my third finished garment for the current challenge at the CIC Yahoo Group. 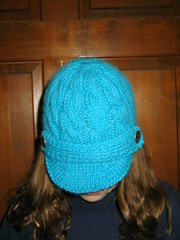 I knit it with Knitpicks Wool of the Andes bulky 100% wool on an Options size US 10.5 circular needle. Thanks to Marguerite for a nice and fast little pattern! I hope it will keep some little person warm. There are so many cable patterns out there, many of them linked on the first two Fall Cable KALs [2005 2006]. If you are looking for something new to whet your cable appetite, the Fall 2007 issue of Interweave Knits has quite a selection of beautiful patterns. Also, if you are on Ravelry, you can search for patterns by using the tag 'cable'.